Benefit from expert advice for your cloud solutions, broadband speeds, office moves and managed WiFi. Clear reporting and cost efficient results. We offer IT consultancy throughout Sussex and Surrey for businesses that require guidance on how to improve their current IT strategy. We’re proud to deliver bespoke solutions that offer long term cost efficiency. We aim to help you run seamless networks and data backups that you’ll always trust, as well as transparent reporting; you don’t need to understand tech jargon to feel the benefits of efficient IT solutions. Our services are tailored to suit you. Our team of specialists will advise on the best programmes for your needs. With a wealth of experience working with businesses, we take the time to understand what you do and how IT can make that easier. To benefit from our services, find out more about how we can help below and call us on 01403 290 321 or 01293 912 321 with your enquiry. We have years of experience in helping companies relocate whilst maintaining their networks and IT solutions. For example, you don’t want to lose access to your data or suffer equipment damage and it’s also important that machines which get hot are still efficiently cooled. Businesses need fast, secure and reliable broadband that works. We can review current broadband services to assess performance and then make improvements as necessary. If you do find yourself having a problem, our broadband services include installing lease lines and bonded broadband, which can both be planned alongside your usage, whether you need faster download times or connectivity between two locations. With a whole range of WiFi options on the market, our team can evaluate your business and recommend the WiFi system that’s right for you, from hive based to controllerless solutions. 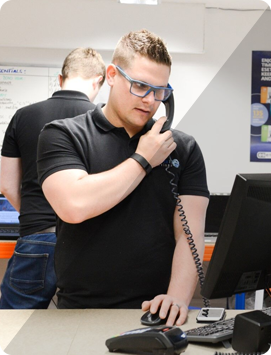 Once installed and operating, Woodstock IT can then manage your new system to ensure you’re getting the best service from it at all times, with health checks and ongoing maintenance. We can install, terminate and assess your current data cabling, making sure everything’s working to top speeds and is well maintained. Such services futureproof your business and allow for expansion should you find yourself using even more data. During installation and maintenance, we aim to keep disruption to a minimum and plan cable routing in advance so your office stays tidy, which we appreciate is particularly important if you’re client facing. Depending on the scale of your IT set-up, you may need to use a different class of server, from small and basic to much larger and complex. Once you’re using the right server, whether Dell, Fujitsu or other top brands, we can advise and manage on how best to maintain it’s performance. As servers help you and your staff share files and work together, it’s important to ensure the data is securely protected, as well as offering a reliable and cost effective service. Using Cloud based solutions allows you to stay fully connected, anywhere and anytime, ideal for the demands of modern businesses. Unlike physical servers, the Cloud is a virtual way of structuring and organising your data which is fully scalable. Our teams can get you started on the Cloud, or improve your current system and provide you with online backup and outsourced management.